It's always been the big question - do you prefer red Goods or blue Goods. Now you have a choice. Select red for Home Style Chips or Blue for Kettle Cooked Chips. Either way we are sure you will find them "Good". A carton containing twenty-four 1 oz. 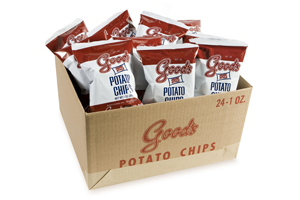 snack sized bags of Good's Potato Chips. Sorry, no foreign shipment on this item.